Relieves painful arthritic and "hammer" toes. 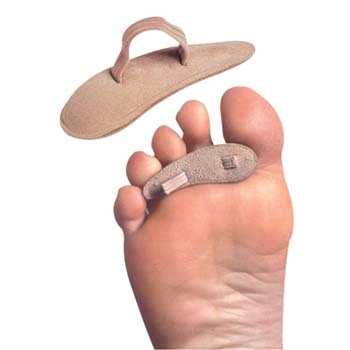 Soft, felt-covered crescent-shaped pad nestles under bent toes to relieve pressure and friction, especially on toe-tips. Fits comfortably in shoes. Cotton-covered elastic loop correctly positions cushion under the second, third and fourth toes. Washable and reusable. Specify Left or Right. This Size Chart is a general guide to help you choose the correct PediFix product size.